The Tour de France is the biggest event on the cycling calendar and the cols of the Pyrenees always feature on the action-packed itinerary. 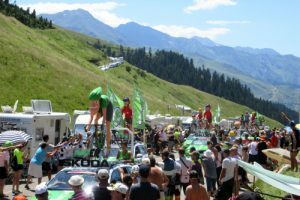 These mountains have long been the battleground for the yellow jersey and the buzz amongst the spectators on TDF day has to be experienced to be believed. If you’re a cycling enthusiast, seeing the event ‘in the flesh’ has to be on your bucketlist. Add to that the opportunity to test yourself on one of the legendary climbs just before the pros come along and show you how it’s done…. well, you have the makings of an unforgettable cycling experience right there! 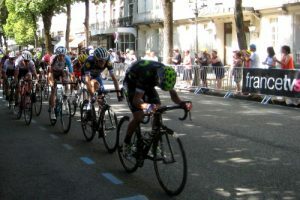 This year, stages 16 and 17 of the Tour de France take place in our immediate area. On the 24th July, stage 16 includes the col de Portet d’Aspet, col de Menté and a final flourish up the col du Portillon before what’s sure to be a fast and furious run in to the finish in the pretty spa town of Bagneres-de-Luchon. On the 25th July Luchon is the starting town for a short but pokey stage which takes the riders first up the col de Peyresourde, then down the beautiful Louron valley before another climb up to the col de Val Louron-Azet, a descent to the Arreau valley and a grand finale up the Col du Portet. 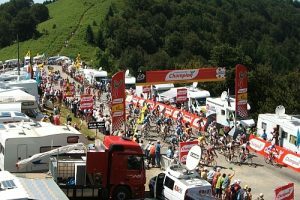 If you are a cyclist who’s coming down to experience the full Tour de France circus in the Pyrenees this summer then read on for our insider’s tips to help you get the most out of this amazing spectacle. If you’ve never cycled in the area before you probably won’t know much about the cols that the pros will be tackling. If you want to be in the very best spot to watch them suffer then you need to do your homework. If you’re planning on cycling up to one of the cols then check out the col profile on Cycling Cols to see whether it’s within your abilities. It is? Cool! Next, find the best spot at which to view the TDF circus. We use Google streetview to get an idea of the climb ‘in the flesh’. Thanks to its 360 degree picture you can check out the views from various vantage points so you can find the one that gives you maximum visibility as the riders approach. Don’t even think about positioning yourself on the descent side of the col. All you’ll see is a blur of riders as they fly past. You want to be where the suffering really happens and where the atmosphere amongst the spectators is truly electric! Now that you’ve decided on your viewing spot you need to make sure you allow plenty of time to get up there. You can see the outline timings for the respective stages on the TDF website. 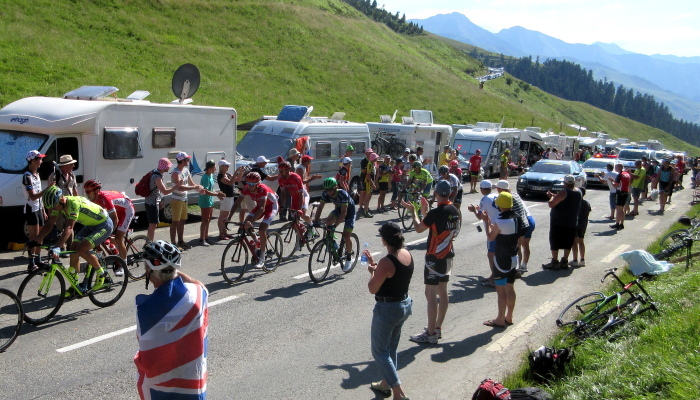 The publicity ‘caravane’ follows the tour route approximately 2 hours before the cyclists are due to arrive. But the road may be closed to vehicle traffic up to 2h before then and will even be closed to cyclists and pedestrians at the very latest 1h30 before. How disappointing would it be to arrive at the base of the climb only to be turned around by the gendarmes! Don’t underestimate the length of time you’ll be out on the hill on Tour de France day. If you have chosen a viewing spot that’s close to the start of the stage you may need to be up at the crack of dawn! Make sure you take enough food and especially drink. Fluids are particularly important as it may well be very hot in the exposed sun and you risk dehydration. Although there is a Vittel water float in the caravane that throws out bottles of water there’s no guarantee that an enthusiastic Dutch man won’t beat you to the grab! The same applies to the mini packets of madeleines, saucisson and Haribo that are liberally distributed. Goodies from the publicity caravane are hotly disputed! If you’d rather not carry up sufficient provisions to sustain you for the day, consider riding up to the Col de Péyresourde or to the Col de Menté where there are cafes serving drinks and food. They also have those all important toilet facilities too. One other bit of advice we’d give is to consider taking a pair of lightweight shoes/flipflops/sandals up with you, as cleated cycling shoes are not the most suitable footwear to be walking around in for hours. Suncream and insect repellent should also be in your bag. Once the riders and the ‘voiture balai’ (sweeper van) have passed through, the gendarmes will oversee the re-opening of the road to traffic and cyclists. This is probably the most dangerous part of the day. But it could also be the most fun of you get it right. Be ready to set off back down the moment the road reopens. The gendarmes usually allow cyclists to get on their way before any vehicles leave which should give you a relatively hassle-free descent if you’re on the ball. However, if you get caught behind all the traffic, people on foot and a load of other cyclists who are tentative descenders you may find you are on the brakes for the whole descent which is really hard work and tough on the hands, arms and body. It’s also dangerous as pedestrians wonder across the road without looking and campervans cut the corners, so do remain vigilant! Seeing the Tour de France up close and personal is an experience like no other. Seeing the cyclists do battle on the legendary cols of the Pyrenees and having the opportunity to ride those same cols yourself will give any cycling enthusiast some very special memories indeed.